Students walked out from around 100 schools in France, protesting against the pending reforms the government wants to make and in solidarity with the ‘gilets jaunes’ (yellow vests) movement. Videos are surfacing of student groups looting shops, setting cars on fire and breaking windows. 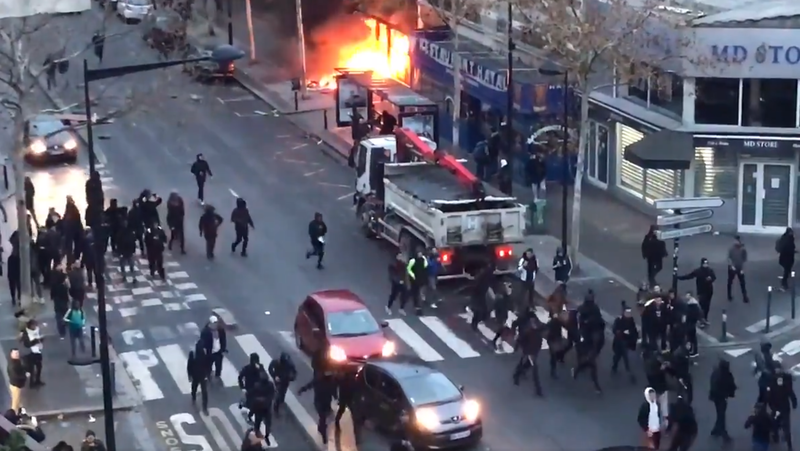 The videos were filmed in Aubervilliers, near the lycée Timbaud (high school Timbaud) in a Parisian suburb this morning where students walked out in protest and looted shops, burnt a car and started throwing rocks to the police forces who tried to arrest them. It comes after a weekend which saw some of the worst rioting in central Paris in a decade. Facing his biggest crisis since he took office in 2017, French President Emmanuel Macron, elected on a centrist platform, has meanwhile instructed his prime minister to hold talks with the different protest groups, including the gilets jaunes. More than 100 people have been injured and almost 400 arrested in the violent anti-government demonstrations, sparked by fuel tax hikes. Related coverage: Paris Is Burning - EU Press Asks Whether Macron ‘Can’ Continue?. The ‘gilets jaunes’ movement has already declared that they will hold new protests next week. Since the protests started two Saturdays ago, the number of demonstrators has been declining. On the first protest day, 282,000 activists were on their feet around the whole of France. Last weekend there were 166,000. This Saturday, according to the Ministry of the Interior, 136,000 French people were demonstrating. For next Saturday, the 'fourth act' of the protest is on the agenda in Paris. Despite the decreasing number of demonstrators, support for the protest movement is not declining. Indeed, according to some polls, the number of French people who support the yellow vests increases. About three-quarters of the population supports the protests. the protests are about the savage immigrants. Looting shops of fellow Frenchmen is ludicrous. If the shops are muslim owned or islamic cultists, then loot away.